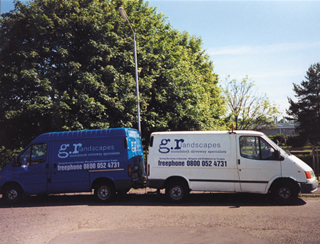 GR Landscapes are a local business, a major installer of driveways, patios and landscape projects in the Bearsden, Milngavie and Greater Glasgow areas since our formation in 1985. We are a privately owned business and unlike many companies we do not rely upon commission salesmen and installation squads. All our installation teams are highly motivated, professional craftsmen and are employed directly by the company. Every project is overseen by the proprietor and managed by our installation team leader. No contract is too big or too small and, when required, we can use our heavy plant machinery which ensures a fast, efficient and professional installation. We are construction based company and adhere to all current building regulations.